• Outcompete the competition. Faced with tremendous growth opportunities estimated in Billions of Dollars, new goliath competitors, i.e., cable and telephone providers, etc, are storming the market. Protect your local market and expand your Connected Home Services business to reach even more residential clients, large and small. Start creating RMR opportunities, like those enjoyed in the security market for years, plus get greater client retention and service levels in the process. 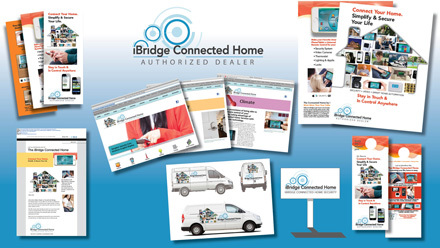 iBridge® Connected Home Dealers Wanted! • iBridge's optional, award-winning WiFi, 7” low-profile android touchscreen, mirrors the App, plus offers web-browsing, photo-frame, weather and conveniently uses an on/off magnetic wall-mount/charging station or table-top stand. • As simple and cost-effective as the iBridge Connected Home System is to use and install, it can still provide CE Pros’ sophisticated scenes with custom naming, auto-populated on UI screens, and automated schedules, as desired. • Advanced Scenes and Schedules, once only for high-end homes – Now made easy and affordable.